Thanks to a Rising Star scholarship to Cedar Valley College, Kyndale Chamberlain has fulfilled her immediate career goal of becoming a licensed veterinary technician. She’s worked her way up from being a kennel technician while still in high school. 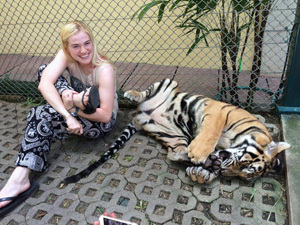 And last summer, she participated in a summer abroad program working with abused dogs and elephants in Thailand. Her high school veterinary course provided a stepping stone to land a kennel technician job at Pet Medical Center of Duncanville, where she still works more than four years later – though now as a licensed veterinary technician. She earned that designation at state and national levels last fall, after graduating from Cedar Valley’s Veterinary Technololgy program in May 2015. 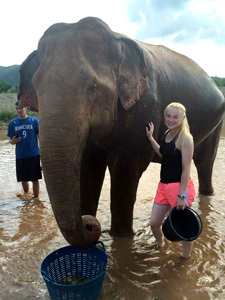 After earning her associate degree in May 2015, Kyndale had the opportunity to participate in Loop Abroad, a hands-on summer abroad program in Thailand for students working with animals. “The first week, I worked with Animal Rescue Kingdom with more than 200 dogs, neutering and drawing blood,” she says. “The second week I worked at the Elephant Nature Park where we fed, bathed and dressed the wounds of elephants, many of them abused. I enjoyed everything about my experience with Loop Abroad — though not the Thai food so much since I’m a picky eater! It was really a learning experience and I want to go back. “For now, I’ve reached my career goal of becoming a licensed veterinary technician. What I love about my job is educating people about animal health care. We don’t just play with puppies all day! Our students and alumni are making a difference and giving back to their community. These are some of their stories. You can make a lasting difference for future students by starting a planned gift today. ©2016 - 2017 Dallas County Community College District Foundation, Inc.